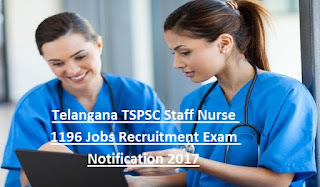 Telangana TSPSC Staff Nurse Jobs Recruitment Notification 2017. Interested candidates can apply online applications through TSPSC official web portal @www.tspsc.gov.in. Online application process starts from 16-11-2017 to 11-12-2017. Selection of candidates for TSPSC HFW Staff Nurse Recruitment Notification 2017 will be based on merit in Computer Based Recruitment Test CBRT or Offline OMR based examination. 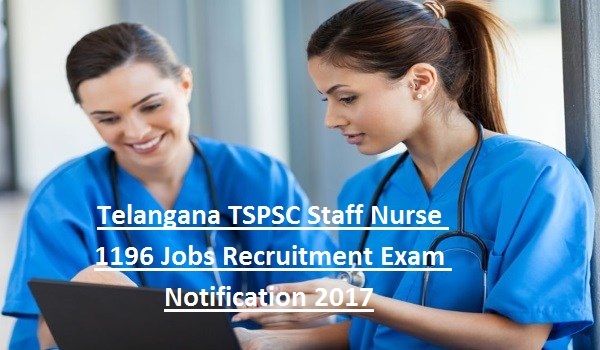 Other details regarding Age, Pay scale, Number of vacancies, Selection process, Eligibility criteria of Telangana TSPSC HFW Staff Nurse Jobs Recruitment Notification 2017 are given below. Click here to see the notification of TSPSC HFW Staff Nurse Jobs Vacancy Recruitment. Starting date for TSPSC Online Applications: 16-11-2017. Closing date for TSPSC online submission: 11-12-2017. TSPSC Staff Nurse Exam Date: January 2018. Hall Tickets/ Admit card can be downloaded 7 days before the Examination date. There are total 1196 vacancies available in Telangana State PSC HFW, Vaidya Vidhana Parishad Staff Nurse recruitment. Category wise vacancies are given in TSPSC official notification. Candidates must have completed Nurse Training Course General Nursing Midwifery GNM/ Diploma course or its equivalent qualification or BSC Nursing from a recognized University/ Institution. The candidate should have age limit between 18 years to 44 years as on 1st July 2017 and Upper Age relaxation for SC/ ST candidates is up to 5 years, for PWD category candidates is 10 years. Selection for TSPSC Gurukul recruitment vacancies will be filled up on merit basis of on Computer Based Recruitment Test CBRT or Offline OMR based Test (objective type). TSPSC Gurukul Staff Nurse Exam Date: January 2018. Pay Scale for this Telangana PSC latest recruitment is Rs. 25,140 to Rs. 73,270/- plus other allowances. Online Application processing fee for all candidates is Rs.200/-, Examination fee for general candidates is Rs. 120/-, for reserved candidates is Nil. Eligible candidates can submit online applications before the last date i.e. 11-12-2017 through the official web portal of Telangana State PSC @www.tspsc.gov.in. Read the user guide carefully from TSPSC official notification to fill required columns of online application form. Upload Photo, signature and other required documents along with application. 1. Telangana Social Welfare Residential Schools: 121 posts. 2. Mahatama Jothiba Phule BC Welfare Residential Schools: 135 posts. 3. Telangana Minorities Residential Schools: 195 posts. 4. Telangana Residential Educational Institution Society: 32 posts. 5. Telangana Tribal Welfare Residential Schools: 50 posts.